Have 25 or more people? Call for group rates. Enjoy our expertly narrated Isles of Shoals and Portsmouth Harbor Tour with the added bonus of a guided walking tour on Star Island! You'll hear the fascinating history and lore of Portsmouth Harbor as we navigate 10 miles of river and ocean out to Star Island, one of the first footholds for settlement in the new world. Disembark with our tour guide and explore Star Island. Your guide will walk you through over 400 years of rich history including the charting of the Isles in 1614 by Captain John Smith of Jamestown and Pocohontas fame who was given the isles as a reward for his efforts on behalf of the Crown of England. Hear the legend of the pirates Blackbeard and Captain Kidd, and the lady ghost of White Island. In the 1800's Resort hotels were built on Star and Appledore Islands and the Shoals became one of the most popular vacation spots on the New England Coast. You'll see the Oceanic hotel, which rivaled the grandest hotels of the time and is still in operation today. Your tour will take you through the replica of Gosport Village, a fishing outpost dating back to the early 1600s which includes the picturesque Stone Chapel and several cottages. You'll also see the tallest gravestone in the state of New Hampshire, the John Smith Monument, and the Caswell Cemetary. After your walking tour you'll have time to visit the giftshop, bookstore, and snack bar in the hotel if you'd like. The guided walking portion of the tour is optional and you are welcome to explore the island on your own. 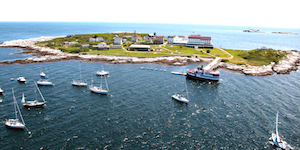 This cruise allows approximately 1 hour on Star Island.